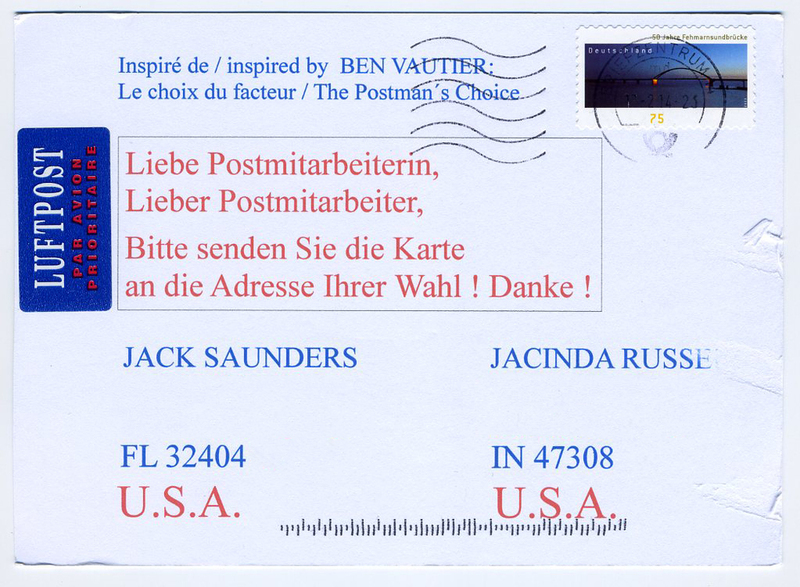 Today, I received a postcard in "hommage à Ben Vautier." The piece was The Postman's Choice from Flux Year Box 2 and the man who sent it resides in Berlin. It was fitting because my most recent submission to the Postcard Collective comments on Mail Art subversion and it is a path I would like to continue to pursue. This post provides that inspiration. In "The Assault on Culture: Mail Art," Stuart Home writes: "Individual Fluxists also dreamed up methods of subverting the postal system and increasing the involvement of postal workers in their mailings. The best known example of this is the Ben Vautier postcard "The Postman's Choice" (1965). This was printed identically on both sides with lines ruled out for different addresses and space for a stamp. It was left to chance and the postal authorities to decide which of the two possible addresses it should be delivered to." It was easy to see why the post office delivered it to me due the location of the address on the card above. I feel badly that Jack Saunders was not able to participate in this action (or be a recipient) and I cannot help but think that should be remedied. Maura Jasper's "Wish You Were Here"
"Postcards of Muncie, Indiana landmarks dating between 1910-1930 are composited with the same landmarks as they exist (or not) today. Wish You Were Here addresses changes in the cultural and economic landscapes of Muncie, Indiana over the past 80 years. At the turn of the 20th century, Muncie was a thriving industrial city due in part to the Indiana Gas Boom years earlier which had attracted numerous businesses to the area. With the decline of manufacturing Muncie (like many cities in the Midwest) has seen a decline in jobs and population, leaving behind a landscape of empty downtown streets crumbling homes. Remarkably, it retains a strong sense of civic pride as the city struggles to reinvent itself. This is an excerpt featuring seven locations from this ongoing project." Wish You Were Here (2012) from Maura Jasper on Vimeo. My favorite part of Maura's composites is the ghostly in-between; suddenly a child appears from 2012 just as older family fades away on the same porch. Wish You Were Here describes so many dilapidated towns in the Rust Belt that it shocks me when the present day view depicts a scene more positive than the original. Janfamily (Chosil Jan Kil), "How to Take the Long Way Around"